Programmed cell death (often referred to as apoptosis) is a normal feature of animal development and tissue homeostasis. The misregulation of cell death has been implicated in a diversity of human disorders, including cancer, autoimmune diseases, heart attacks, stroke and neurodegenerative diseases. Our laboratory has analyzed the mechanisms responsible for programmed cell death by studying the nematode Caenorhabditis elegans. During the development of C. elegans, 131 of the 1,090 cells generated undergo programmed cell death. We have characterized developmentally, genetically and molecularly the roles of many genes that function in C. elegans programmed cell deaths. We have analyzed genes that control the death process, genes that act in the phagocytosis of dying cells by their neighbors, and genes that function in the digestion of the DNA of cell corpses. 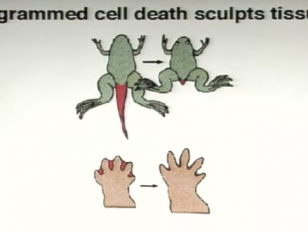 We have studied in some detail genes that specify which cells will or will not express this cell-death program. Most but not all of these genes involved in cell-type-specific programmed cell death encode transcription factors that specify whether or not the first gene in the core killing pathway, egl-1 (which encodes a BH3-only member of the BCL-2 protein superfamily), is transcribed. Many of the C. elegans genes involved in programmed cell death show structural and functional similarities to genes that act in mammalian apoptosis, indicating that the major mechanisms of programmed cell death are conserved among organisms as distinct as nematodes and humans. A number of the human counterparts have been implicated in human disorders, including deafness and cancer. We recently have been analyzing a few cell deaths that occur in the absence of the activity any of the components of the core killing pathway. These deaths occur even in mutants defective in all four C. elegans caspase genes (caspases drive apoptosis in worms and other organisms) and involve cells that normally are killed rapidly by the core killing pathway but in the absence of this pathway still die but do so more slowly. Thus, there is a second as yet uncharacterized pathway for programmed cell death in C. elegans, and for at least some of the cells that die by programmed cell death during C. elegans development two distinct mechanisms of cell killing act to ensure that the cells that should die do so.